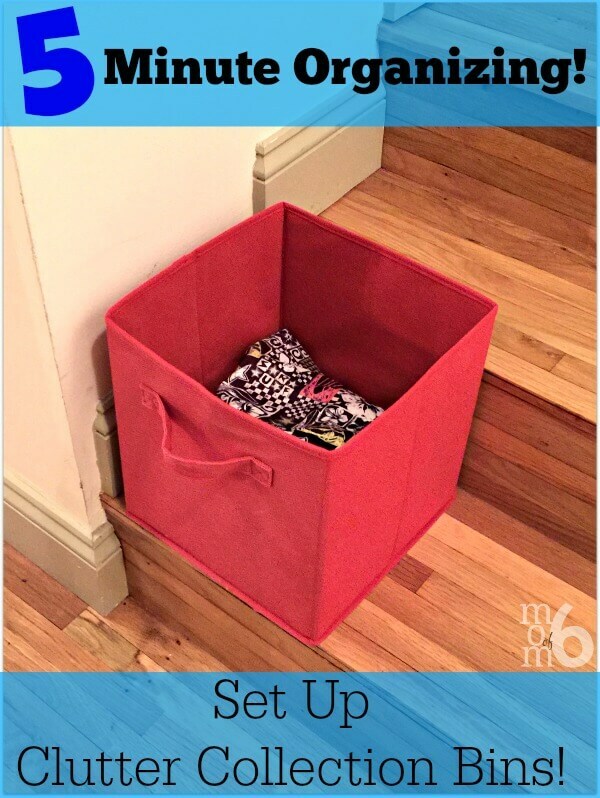 Today I've got a quick organizing tip that you can put into place in your own home in just 5 minutes! (You've got 5 minutes, don't you?) One of the clutter issues that drives me batty around my own home is my kids' tendency to just leave items… everywhere! They come home from school, take off their shoes and leave them in the middle of the family room floor, kicked under the couch, beneath their seat at the kitchen table- just everywhere. And when I see the shoes, I'll remind them (okay- nag them) to pick them up and put them downstairs in our mud room. But most days, it just doesn't happen. And I find myself tripping over them constantly. And the socks… they are all over the house too. Or it's their electronics chargers, or the scarf my daughter wore to school, or the earrings she took off and left on a table. Or the half-completed craft project, the post it notes with their new Webkins passwords, it's just…. all.the.stuff. 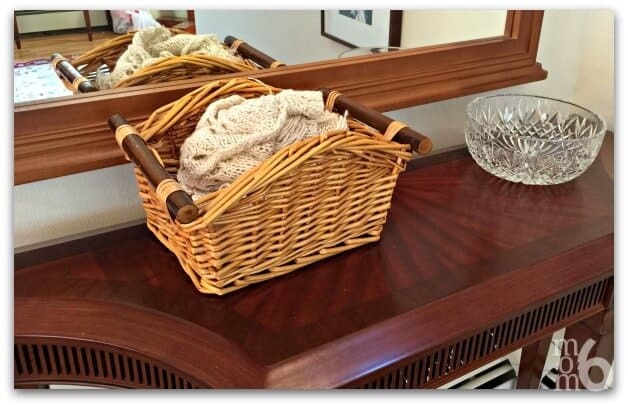 Since I don't want to spend my time picking up after the kids and returning items to their rightful spot, and yet I prefer to hang out in a home that isn't cluttered- I've set up “clutter collection bins” in a few strategic areas around the house. Our mud room area is in our basement, but I don't want to have to head down there every time I come across a kids shoe! 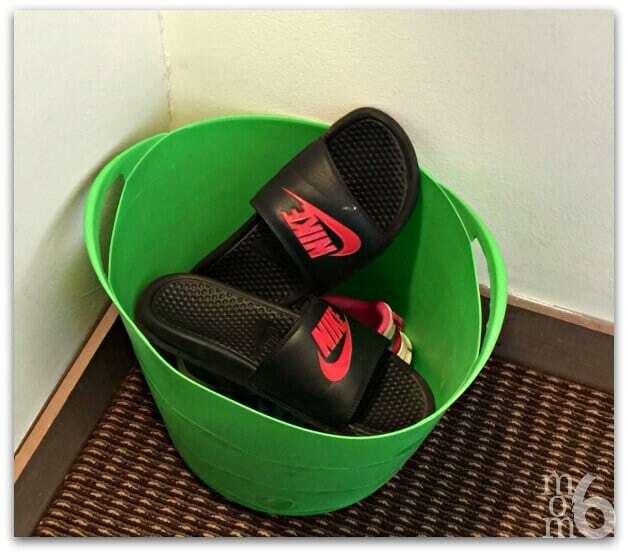 So I have this plastic bin on the landing leading down to the basement, and if I aim well- I can just toss the shoes into the bin and ask the kids to empty it the next time we are heading out the door. And then there are the things that I don't want to throw into one of the larger bins because the item is too small or too fragile- like earrings, scarves that can snag, electronic items, etc. I place these in this small wicker basket that I can keep on our foyer table and I'll just carry it upstairs with me at the end of the day and hand the items out to the kids. See- all it takes is 5 minutes and a few strategically placed bins to help keep us more organized! I have the same problem. I didn’t know what else to do now that my 3 sons are adults and still leave their things behind. This is an excellent idea. Thank you! My daughter is like a tornado, leaving things in random places all over the house… never where they belong… and you can always tell where she’s been because there’s a trail of her things left behind. No matter how much teaching/nagging I’ve done, I just can’t break her of the habit! I love the fabric bins on the stairs idea. I’ve used baskets with handles before but someone always ends up tripping over them or the handle gets caught on something and the contents of the baskets spill out. I’ve got some extra fabric bins from my kids’ rooms so I’m going to try those… I might even do one in each colour for each of my kids and then they have to empty their own bin. Thanks for the idea Sharon! One of my girls has the same “whirlwind” habit of leaving things everywhere! In fact, most days the bin on the stairs is filled with her belongings! Thanks so much Susan! It’s a quick tip- but one that saves my sanity every day!